Looking for a very special poster for a special someone... Extremely rare first-year-of-release UK quad for Hitchcock classic. 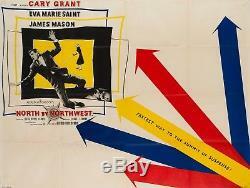 Starring Cary Grant, Eva Marie Saint and James Mason. Super cool and very alternative graphics. Actual poster size 30 x 39 3/4 inches. Very little cross fold separation. Little pin-holes, light tape marks and creases and wear on corners. Light staining in places on folds. Otherwise in superb unrestored condition. The item "Original North by Northwest, UK Quad, Film/Movie Poster 1959, Hitchcock" is in sale since Monday, March 26, 2018. This item is in the category "DVDs, Films & TV\Film Memorabilia\Posters\Originals - UK Quads\1970s".